What good timing to present a Christmas concert. It snowed and the weather did feel like winter, somewhere between 0 and -4 degrees. 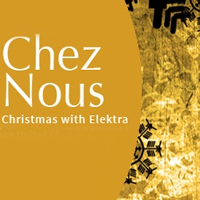 Old and new Christmas songs flowed together in Elektra’s annual celebration of the Yuletide season, called Chez Nous (Our Home). In the program we heard the world premiere of Winter’s Grace by Edward Henderson, a work honouring the memory of the late Diane Loomer, former Conductor and Artistic Director of this Choir and its brother male choir, Chor Leoni Men's Choir. She passed away two years ago and the baton was passed on to Morna Edmundson who conducted this concert. Another world premiere was Northern Lights by Norwegian composer Ola Gjeilo who dedicated this coposition to Elektra. Guests for this concert were A Touch of Brass, an ensemble of brass instrumentalists composed of Tom Shorthouse (trumpet), Jim Littleford (trumpet), Laurel Spener (french horn), Jeremy Berkman (trombone) and Dave Sabourin (tuba). 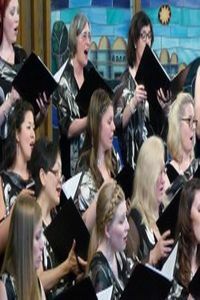 Another guest choir was the Eric Hamber Women's Chorale from the Hamber Secondary School in Vancouver, under the directorshiip of Les Nerling. They joined together with the Elektra ensemble in a few songs, especially the sing-along "Ding-Dong! Merrily on High". Another sing-along we all joined in was the popular Christmas carol "Hark, the Heralds Angels Sing!". I liked the last song "Night of Silence" by Daniel Kantor which was intermixed with "Silent Night", sung beautifully by both choirs and accompanied by A Touch of Brass. And finally, ending the program was the traditional English carol "We Wish You a Merry Christmas". This was a delightful program well-timed for the first day of snow in Vancouver.